Both the iPad Pro variants will be available in 64GB, 256GB, 512GB, and 1TB storage options. The Apple Pencil and Smart Folio case will also be available starting Friday. If you were looking to pick up the new iPad Pro, then there is good news for you. Both the new iPad Pro variants will be available in India starting Friday November 16. The 11-inch iPad Pro and the 12.9-inch iPad Pro were announced at an event in New York on October 30. Both variants of the new iPad Pro are up for pre-order at Apple premium resellers - Maple Store and Unicorn Store. Unicorn Store is also offering online pre-orders for the tablets. Both stores have launch offers of up to 5 percent cashback on EMI via Citi and Axis Bank credit cards . There is also no-cost EMIs from Bajaj Finserv. Both claim an effective monthly cost starts at Rs. 3,183. Speaking of the design, the new iPad Pro is 5.9mm thick and the 11-inch iPad pro weighs 468 grams, whereas the 12.9-inch iPad Pro weighs 631 grams. The new iPads have forgone the home button in favour of Face ID. This is how the 11-inch iPad Pro manages to get an 11-inch display in the 10.5-inch iPad Pro's form factor. The Pro still has 4 speakers and this time the devices have magnets to hold and charge the new Apple Pencil. For connectivity Apple removed the lightning cable in favour of USB-C, giving users the ability to connect the iPad to a host of devices such a 5K display. The new iPad Pros can also be used as power banks to charge other devices. Speaking of the display, the 11-inch iPad Pro has a resolution of 2388x1668 pixels giving it a pixel density of 264ppi. 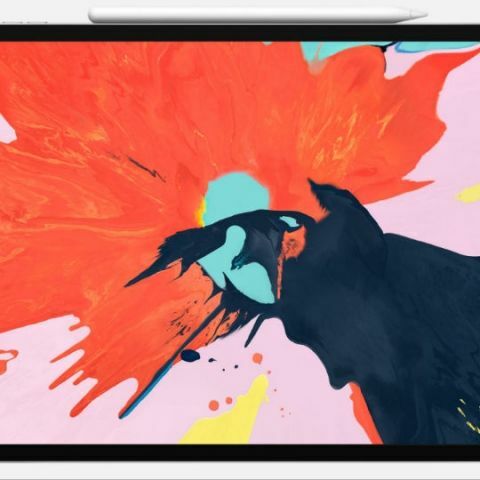 The 12.9-inch iPad Pro has a 2732x2048 pixel resolution giving it a resolution of 264ppi. Both the tablets have Apple’s True Tone display, fingerprint-resistant oleophobic coating and 600 nits of brightness. The displays of the new iPads support 120Hz refresh rate. Under the hood, the new iPad are powered by the A12X Bionic chip. The new chip has more than 12 billion transistors. It is an 8-core CPU with 4 performance cores and 4 efficiency cores. Apple says that the new A12X Bionic gives 35% faster single core performance than its predecessor whereas the multicore performance is up to 90 percent faster. Coming to the camera, the new iPad Pros will now support Face ID and for this it has Apples True Depth front facing camera. The front facing camera is a 7MP shooter, whereas the rear camera is a 12MP one with an f/1.8 aperture lens. The camera can record video at a maximum of 4K at 60fps with slow mo at 1080p at 120 fps and 720p at 240 fps. The tablets also have Bluetooth 5 under the hood.